Angels are created by Divine Light, not by God’s Mystery. Fallen angels have lost this Light, and only fire is left within them, but no Light. Angels are beings for whom corporeal bodies are not provided; they are beyond matter. The heart of Angels consists of pure Light. Angels know only one art – devotion. Angels speak spiritually and remain silent spiritually. The nature of both speech and silence of Angels is Light. Angels pour their thoughts into the human Soul. Angels are intelligent, but not wise, whereas humans are thinking beings. Angels are part of the Light of God, but they are not part of the Wisdom of God. The heart of an Angel is a universe of pure Light. Angels learn in the Light, but deep Wisdom is incomprehensible for them. Angels do not have the freedom of humans. A human can become an animal, a beast, a monster, even a Son, even a God; whereas an Angel remains an Angel – limited to live only in the Light. Angels are spiritual, while humans can become even Divine. Angels have no desires: they have Love and service within. Angels are artists of pure thoughts; and that is their strength, that is their sword. Angels live in the Light but do not have a path towards God. Angels create the pure, spiritual communication between people – not the earthly ones. Angels know Love only as spiritual radiance. Angels are invisible but they can also become visible. The very pure and positive thought is like a powerful Guardian Angel. Angels are pure reason in a spiritual body. Some people ask me whether I have seen Angels. Well, I have; and I have had hundreds of conversations with them; but right now I have no intention to talk to you much about it. And also, you will not understand me because it is my experience – and I want you to have your own experience; but first, you must become esoteric disciples, who do not know doubt, fear and hatred, who are above the astral world. The Great Teaching of the Master, which, in its core, is universal, restores the Primary Life – the Great Dynamics. I must warn that our Teaching is not revealed to everyone, although it is so beautiful and so deep. Recently I was visited by members of the Church, a group of people, and they threw a lot of curses against me and against the Master. Of course, these curses do not work; yet we do not reveal the core of our Teaching to such „angels“. We do not make mistakes in this regard… There are three types of Angels, everyone must know that: earthly, spiritual and Divine ones. And when I say everyone, this applies to everyone who deals with these issues. Earthly angels are fallen angels because they have trampled on the Divine in themselves. How do Angels feed themselves? They nourish themselves spiritually by doing good. The basic element in their food is Love. Love is the abundance of Life. Angels live in Love, and they absorb this Life: it pours into them and fills them. Actually, this is the Life of God. Angels nourish themselves inwardly… They receive this Life from within – from the Great Divine Beginning Principle, from the Great Inner Beginning Principle. An Angel is always faithful and unfailing to God, in all the ordeals. Now I would like to go back to the basic element of Life – Love. Humans are sent to Earth in order to develop supreme Love towards God, as it is in the spiritual and Divine Angels. Angels are happy because, inside themselves, they have prepared the Divine conditions for the Spirit to instil Himself. Due to their purity, Angels have inner strength within themselves. Angels are able to overcome any evil because they work with the absolute Law of Faith… Only the pure ones receive energy from the Spirit with which to overcome evil. Once you love God, Angels will love you, too… Once God lives within you, Angels will visit you frequently… Once there is Divine Love within you, you will be as a magnet for Angels because they always strive for their Primary Origin, for their Beginning Principle. When an Angel loves you, this Angel reinforces your will-power, your Light, your morality, simply filling you up with its own Life, Peace and Harmony. The faith of Angels is unfailing: it ensues from the profound knowledge of the Spirit. Angels are made of luminous thoughts, which are their fortress, their spiritual body. Angels always keep the purity of their own thoughts; they are always vigilant for the Word. Angels are servants of Love – they know Whom they serve, they know that there is only one Lord, one Master. Angelic Love scatters evil away, because pure Love possesses perfect dynamics. Evil is defeated through dynamic power; and Love, says the Master, is always dynamic… This determines the perpetual destruction of evil… The perfect dynamic power is the perfect weapon. If an Angel has the possibility to get into you, this Angel will arrange your life perfectly. I remember when I managed to get near Angels… I was stunned by their inner beauty… Our conversations were sacred, full of the beauty of the Great and Primary Life. I will never forget the scent of Angels. If Angels do not have favourable conditions to enter and live within you, if the door is closed for them, then devils will torture you a lot… until the Primary Wise Intelligence is restored again – which is actually the main condition. The purity of Angels predetermines the pure energy: this energy is the key of the Absolute World. This energy sets people free from all limitations. I have observed how Angels wage war on evil… They possess a lot of methods… but above all, they fight using their own energy: they direct it towards evil through the power of their own will; and we also know that pure energy is all-penetrating. That which penetrates also purifies… Where there is penetration, there is also conquering. The greater the purity, the bigger the penetration… Through the principle of penetration, God dominates over all beings. If an Angel penetrates into a human, there shall be transformation. An Angel might enter a human and teach him or her inwardly; nevertheless, people, able to provide the perfect conditions for Angels to instil themselves into them, dwell inside them and teach them, are still few. Angels instil themselves only where there is strong aspiration, endeavour and purity of thoughts, wishes and acts. Angels fly away at the smallest whiff of anything negative – envy, hatred, criticism, jealousy, lie. These are tasks that people must resolve because bad qualities are entrances for evil spirits – these are the psychical bandits. They mainly rob the energy and thus they exhaust people… Angels always help, they always bring energy in, they always elevate… Those who can free themselves of any sin become also free of the world and of the limitations called time and space. Freedom is the core essence of the Real World – it is a World without limits. Angels are pure Spirits and this is why they are allowed to penetrate into Reality. Angels penetrate also in time and space in order to help people. Pure Life manifests itself as Supreme Love. Such Life does not need any rituals and ceremonies because the acts of Love are acts of God. Love is a realm that surpasses all sciences and religions. Love is a realm beyond time and space – whereas the lie is a limited world: it is closed within time and space, it is closed inside illusion… The Truth is the symbol of the pure consciousness. The world has no influence upon such consciousness. The world can still hardly talk, it does not know how to speak, and the Divine Language is yet not known. It is no coincidence that the Master says, “The speaking of people, compared to that of Angels, sounds like thunder”… I have listened to Angels speaking – every Angel’s word smells sweet, there is a special scent in Angels’ words… Angels’ words vibrate, illuminate and purify. There are words that give warmth, there are words that enlighten. Angels fight by means of vibrations. Vibrations are a weapon of the Living Fire and of the Living Light. Why does every person look for true Love? Because therein Life shines – Primary Life! In true Love, energy runs high. If a person has no energy, he or she also has no Life within. Angels are open only to the Sublime influences, while devils are open only to the inferior ones. A luminous thought is a crisis for the Devil. For example, the Devil feels tortured if he does a selfless good deed – it is not in his nature. When one starts purifying one’s life, the devils in this person become dissatisfied: it gets already too tight and painful for them. The basic food of true people and also of Angels is Love – the Living Water. If you drink Love, then your Soul breathes special Life. In this Life, evil feels cornered. Meditation is a magnificent method; however, you have to walk along the path of purifying in order to reach the real meditation. If you hate, if you envy, then how can you possibly meditate and how can you perceive the Sublime influence? Angels are always radiant… Their existence is pure Light. Earthly angels, i.e. fallen angels shine only from time to time, and these are their small celebrations. An Angel is pure emanation, pure image of Love. This emanation is beyond time and space. Purity is supreme spiritual power, supreme and transforming, i.e. alchemical power. In this sense, purity is a weapon – spiritual weapon. Without this supreme power, evil always sneaks in and draws energy. Impurity must die – thus, evil will also die. There is no entrance for evil in purity and in Angels: evil has no possibility to penetrate. To take the path of purification means to take the path of the Sublime World. The time for the harvest is coming – the impure ones shall not be able to bear the Hour of the Spirit: they will fall behind. At their stage of development, they are not fit for the New Human Race. I say: Only the pure ones shall withstand the Truth and Its Fire, because purity is a Fiery Principle. Through purity, you are in the safe field. What science or religion can help you if you are not pure? The Truth is Fire that will scatter away all which is impure. The impure ones cannot be united with the Word, which gives Life. Life has always been tough for the impure ones because God is not present in the impure life – while, in the Angelic Life, beauty is so complete that this Life surpasses any expression – God participates in this Life. The New Life begins still here, on Earth, and now. If you are impure, you will always have many desires, unnecessary ones at that – they are your own obstacles. As for purification, I will tell you – you just decide seriously to purify yourself. There are many helpers, visible and invisible: they are waiting for your decision and your striving. Putting your life in order begins with the small things. If you are impure, then you will easily fall into hatred – it means drinking spiritual poison. And do you know what Angels drink? Love – the Living Water, or as they call it “The Elixir of Life”. So you will be born and reborn until you learn what to drink and what to eat. The earthly bread must become Heavenly Bread once again; however, humans must also change. The physical body must thaw just like snow, and Angels must put on, as a garment, their radiant substance again – this is the Resurrection, this is the new consciousness, the New Life. Those who drink from the Living Water are enlightened beings, they beam with Light… Do you know what inner beauty there is within them? That is the Path of the disciple. If you could take a look at this beauty, you would be stunned. This is the Path of the disciples of the White Brotherhood: from purity to holiness and from holiness to perfection. This book represents deep and sacred gratitude towards my Master, known in the world by the name of Beinsa Douno – Peter Deunov. 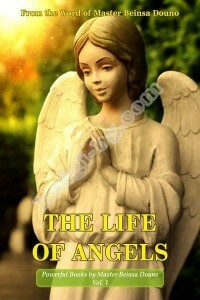 May this book enlighten the way of the earthly angels and help them return to God. May God be glorified in the White Brotherhood, and may the White Brothers be glorified in God’s Love.